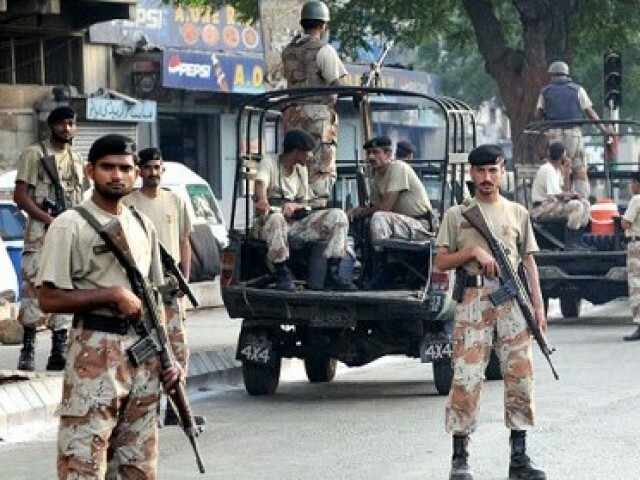 ROHRI: The Sindh Rangers on Friday said that three terrorists have been killed during an encounter in Rohri while the suspects were trying to target an imambargah. A spokesperson of the paramilitary force said that the suspects did not stop at a check point when signalled following which an encounter took place. During the ensuing exchange of fire, the three suspected attackers were killed. As per reports, two suspects also tried to blow up suicide jackets that they were wearing, but the authorities shot them down promptly before they could detonate their explosive vests. The spokesperson stated that the attackers wanted to target Bab-e-Karbala Imambargah. An investigation has been launched to determine the identity of the attackers who are suspected to be members of a banned terror outfit. He apprised that a follow-up action will be taken once the identity of the attackers is confirmed. Meanwhile, Chehlum of Hazrat Imam Hussain (RA) and other martyrs of Karbala was observed on Friday with traditional religious spirit and reverence amid tight security.